I'm sure I've tried to paint bubbles before but when I tried to find the post about it I could not. I have not tagged very consistently, I fear. Anyway, I'm pretty sure these bubbles are better, and they are certainly much bigger. 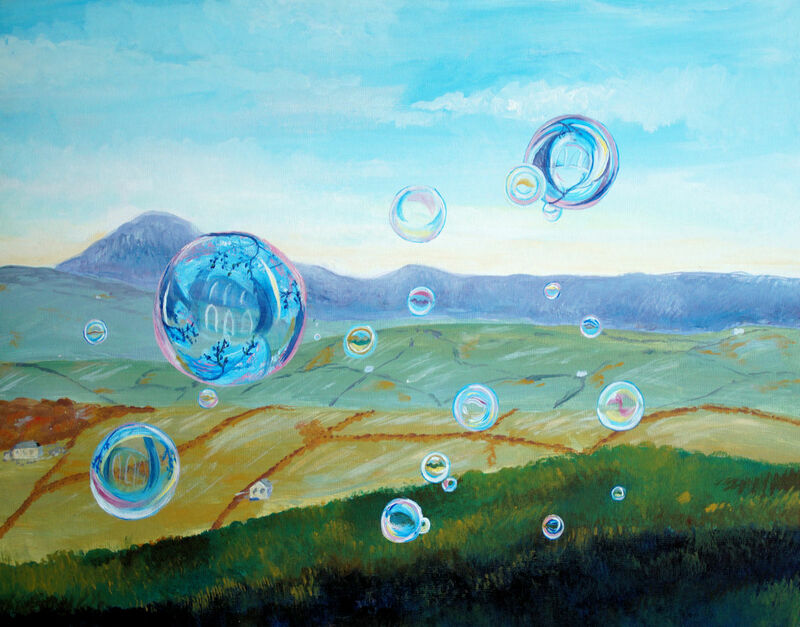 I had this old landscape hanging about which I had painted years ago and abandoned half-made as boring, so I re-painted the sky - which has lost some detail by being photographed, because of course it has, the distant mountains and the foreground shadow, and then tried sticking some bubbles over it, since most of the rest of the class were still doing droplets, but I'd got bored with those. I decided to keep some of the images reflected in the bubbles in my reference photos, and just adapt them a bit to suggest they were reflecting things other than the background. Pan-dimensional bubbles? Bubbles in the space-time continuum? Something like that! I like your magic bubbles.